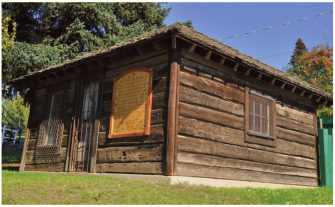 The bucket of blood was the first house constructed in Burns Lake and is located on the Museum grounds at the Heritage Centre. Built by Lyster Pelham Trygarn Mulvany ('Barney'), the founder of Burns Lake, the house was a meeting grounds for trappers, land scouts and prospectos who planned the first town site. It was later turned into a gambling place by Barney's wife. Now located at the museum, the Bucket of Blood is a site to see while doing a walking tour around the town.